We have many of the well-known Designer ranges of prescription glasses frames such as Ray Ban, Prada, Jaguar, Davidoff, Morgan and Polo Ralph Lauren. We also have a wide range of Silhouette titanium rimless and Charmant titanium glasses frames. These both give very light weight and strong prescription glasses. As an independent opticians, we are also able to supply more unusual and innovative ranges of glasses frames that you may have not seen before. Designed in the UK, these high quality handmade glasses frames are popular with many of our patients. We can supply them as standard or provide a Bespoke, ‘made to measure’ service. We spend time taking a series of measurements to ensure that the glasses frame fits you perfectly. Decide to have a Tom Davies frame and you will have a unique pair of glasses. 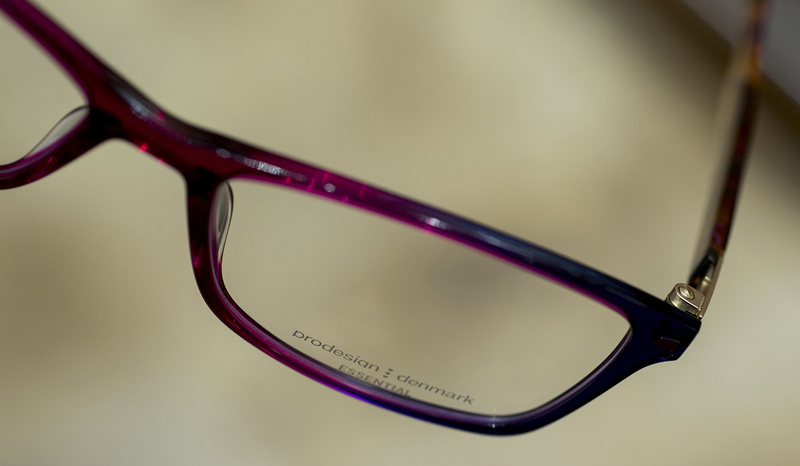 Pro Design create contemporary prescription glasses inspired by Danish design traditions. They use beautiful vivid colours, special hinges and unique details to make their frames truly special. Their designs have their origins in drawings made on real portraits, which results in great comfort and a perfect fit. This collection of glasses frames are designed and made in Spain. They are a combination of vivid colours and modern styles. They give outstanding quality and outstanding value. Many of our patients have fallen in love with the Catalonian feel to these frames. Silhouette are renown for their iconic rimless glasses. These Titanium frames, without hinges, weigh only 1.8 grams. Since their inception in the late 1990’s Silhouette Rimless glasses have become market leaders and have changed the course of fashion glasses.